I’d expected to have the Summer 2013 BnT ready in time for last month’s PulpFest, but eleventh-hour day-job distractions pushed completion of the issue to the very last minute. And then, in my haste, I made the rookie mistake of affixing to the cover an ISBN number that didn’t match the one I’d registered. Correcting and resubmitting the cover file for review would have delayed printing just long enough to prevent final copies from getting to Columbus in time for the convention, so I decided to wait until I returned home from Ohio. It turns out to be good that I did, because shortly thereafter I discovered that a story I had reprinted in the issue — based on the assumption it was in the public domain — may in fact still be protected by copyright. With no idea where the successor-in-interest might be found, and no desire to pay a licensing fee anyway, I was left no choice but to remove the yarn in dispute and substitute another. It took me a little while to find a suitable replacement; that is, one of a similar type and length. Finally I did, and BnT #38 is at last ready for the printer. This issue’s outstanding feature is a lengthy excerpt from Nathan Madison’s recently published book, Anti-Foreign Imagery in American Pulps and Comic Books, 1920-1960. In this richly detailed, extensively illustrated piece Nathan explores “Yellow Peril” fiction from the pulps. His exhaustive study complements Bill Maynard’s celebration of Fu Manchu’s centennial from our last issue. Another book published earlier this year, Will Murray’s Skull Island, pitted Doc Savage against King Kong and aroused much interest not only among the Bronze Man’s fans in general but devotees of Philip José Farmer’s Wold Newton Universe in particular. BnT contributor and Wold Newton adherent Rick Lai examines Skull Island and catalogs its deviations from the Universe in an unusually absorbing work of scholarship. In a separate piece Will responds to critics of his approach. Let it never be said that BnT refuses to present both sides of a story! Will’s second contribution to BnT #38 is an 80th Anniversary hat-tip to the long-running hero pulp G-8 and His Battle Aces, adventures from which are now being offered in audiobook form by Radio Archives. He covers a hitherto overlooked attempt by Popular Publications editors to gauge reader interest in a proposed shift of emphasis for the magazine. This summer marked another important anniversary in American pop culture: Superman debuted 75 years ago in the first issue of Action Comics. Mike Bifulco, author of The Original Superman on Television (a definitive guide now in its third edition), weighs in on the recent theatrical release Man of Steel and reflects on the enduring popularity of the TV series starring George Reeves. This time around our “Tricks of the Trade” department boasts a particularly comprehensive installment by long-time pulp editor and science-fiction specialist Robert A. W. “Doc” Lowndes. Originally written for a 1949 writers’ magazine, this 6400-word treatise is perhaps the most informative piece of its type we’ve published to date. It provides the clearest look yet at how pulp editors appraised the manuscripts they received by the thousands every year. BnT #38 also reprints two fascinating short stories culled from vintage pulp magazines. James B. Connelly’s “The Last Passenger,” from an early 1913 issue of The Popular Magazine, may well have been the first work of mass-market fiction inspired by the Titanic tragedy. “The Tenth Man,” from a 1922 issue of Adventure, is a taut tale of African intrigue by the unjustly forgotten Robert Simpson. Subscriber copies will begin shipping shortly after Labor Day. 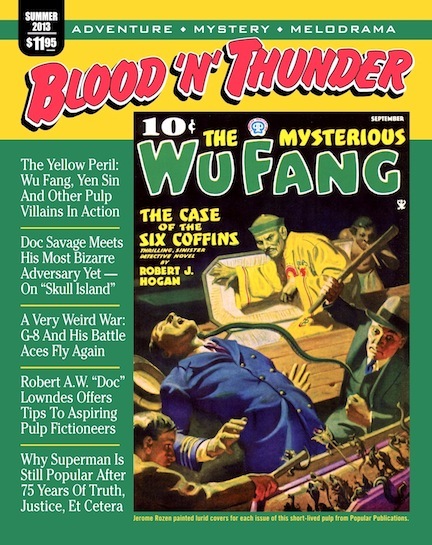 To those of you who either aren’t BnT subscribers or have let your subscriptions lapse, remember that signing up for a year earns you a 20-percent discount on the recently published Blood ‘n’ Thunder Guide to Pulp Fiction. Individual copies of Blood ‘n’ Thunder #38 can be purchased here for $11.95 plus shipping as soon as they are available. The cost of a one-year, four-issue subscription is $40, which represents a considerable savings.